warning: Creating default object from empty value in /var/www/vhosts/valuenewsnetwork.com/httpdocs/modules/taxonomy/taxonomy.pages.inc on line 34. 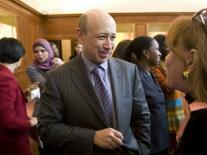 CNBC hilariously likens making partner at Goldman Sachs to being "made" in the Mob. High-frequency trading is one of our favorite subjects over on FierceFinanceIT, and we encourage you to tune in for our take on the subject. The issue has really heated up recently as the regulatory response to the May 6 Flash Crash is expected this month. Writing in these pages in early 2008, we put the total cost to the United States of the Iraq war at $3 trillion. This price tag dwarfed previous estimates, including the Bush administration’s 2003 projections of a $50 billion to $60 billion war. But today, as the United States ends combat in Iraq, it appears that our $3 trillion estimate (which accounted for both government expenses and the war’s broader impact on the U.S. economy) was, if anything, too low. Your real options are explained here by Bill Hardekopf, CEO of LowCards.com and author of The Credit Card Guidebook. “Some Americans may be surprised by new changes in their checking accounts.Overdraft protection is no longer available for checking account customers unless they “opted in” for this service. The new Federal Reserve rules started yesterday. Dodd-Frank bill to become law, so what? The Dodd-Frank bill, like all major pieces of legislation, is tailor made for politicians. The rhetoric rains down like ticker tape, from supporters and detractors alike. Some might call this the “toughest restrictions on the financial industry since the Great Depression,” as the Washington Post did. Wal-Mart to finally get a bank license? The banking industry over the years has worried a lot about Wal-Mart, which has edged closer to seeking a full commercial bank license for years. Count me among those that believe that the G-20 is one of the better approaches to global governance in a world that desperately needs improved international policy coordination. While the G-20 has not gotten to where it could and should be, its periodic meetings provide us with important insights into global policy issues.